My work is nothing more than mere expressions dancing on hollow nothingness; As the curved surface geometries changes form, you can never alter their uniqueness or their fate to remain tied to the two dimensional reality of the picture plane — a truth about the human condition — we are trapped on the edge of the universe yet entangled in all its probabilities in the vastness of infinite space. Yellow Helium Bloom is one of my paintings that will be exhibited at Little Bang Brewing‘s new premises in 2019. Further details to come. 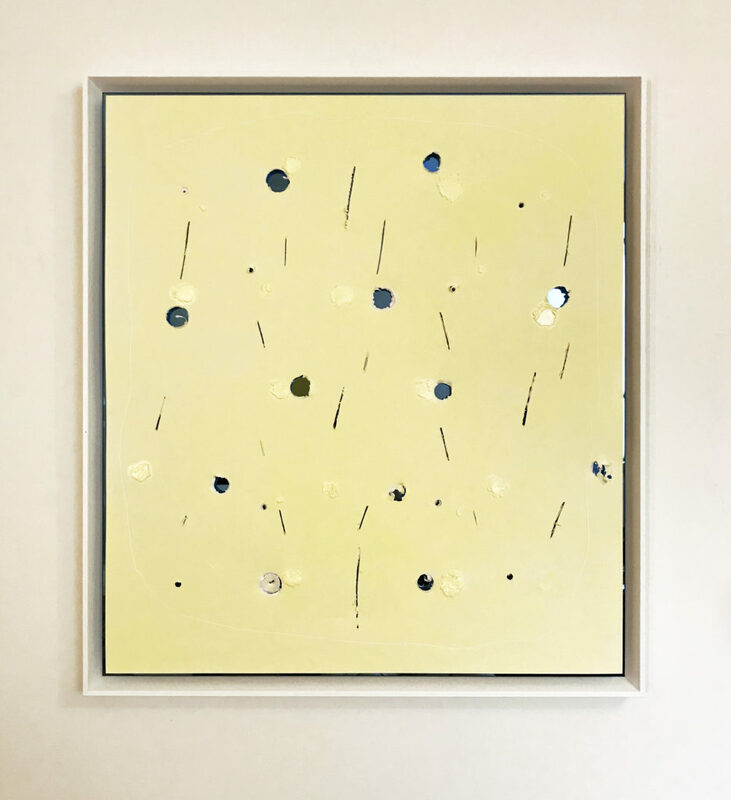 Yellow Helium Bloom by Malcolm Koch, oil on JPP Synthetic, suspended with 12mm spacers off a blue-mirrored backing panel. 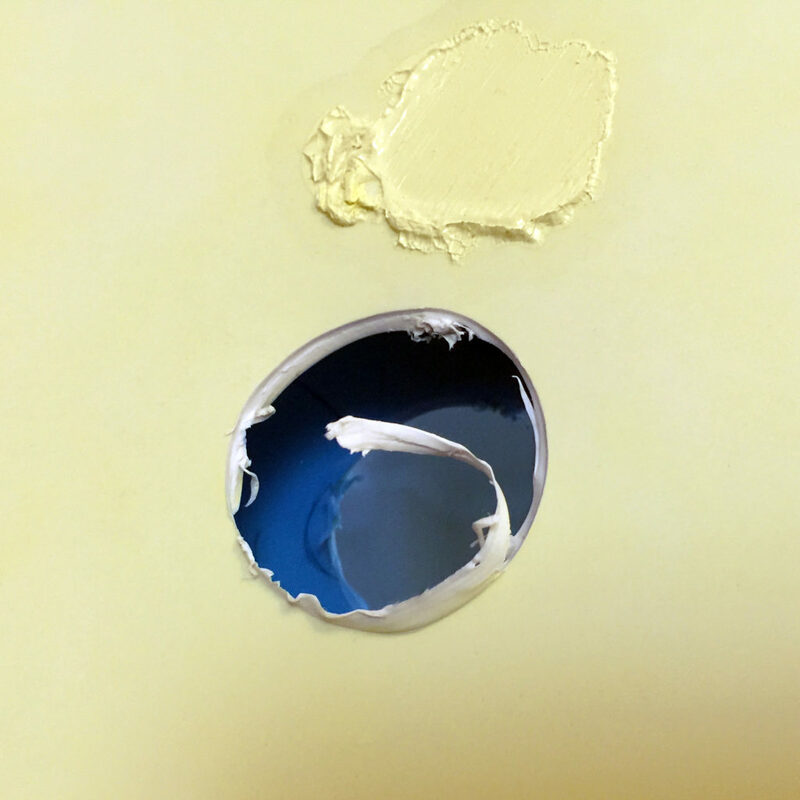 Close up of a ‘drill hole expression’. As the drill bit cut the surface it scolds the edges of the cavity. Leaving behind a mark that shows anti-clockwise spin and reverse side entry. The blue-mirrored panel below reflects back to the viewer the ‘nothingness’ that has been created. Destruction and creation are bonded together through a series of mark-making events that have been achieved in three dimensional form. So when the expressions are ‘opened out’ and observed on the two dimensional picture plane, they create distinct and reciprocal cavities that confines us to the surface — setting in motion a further process of deep reflection or meditation. This entry was posted in Malcolm Koch, Membrane Art, Quantum brushstroke, What is Membrane Art and tagged aesthetic thought, Little Bang Brewery, Malcolm Koch, Malcolm Koch exhibitions, Membrane Art, Quantum brushstroke on December 5, 2018 by admin.